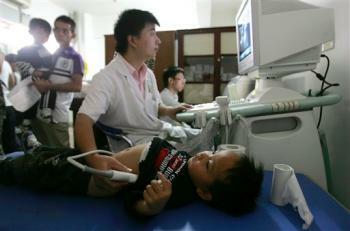 A child receives an ultrasonic inspection for kidney stones at a children’s hospital in Chengdu, in southwest China’s Sichuan province Friday, Sept. 19, 2008. BEIJING (AP) – China’s tainted milk crisis widened Friday after tests found the industrial chemical melamine in liquid milk produced by three of the country’s leading dairy companies, the quality watchdog said. Tainted baby formula has been blamed for killing four infants and sickening 6,200 in China since the scandal broke last week. Some 1,300 babies, mostly newborns, are currently in hospitals and 158 of them are suffering from acute kidney failure. Thousands of parents across the country were bringing their children to hospitals for health checks. 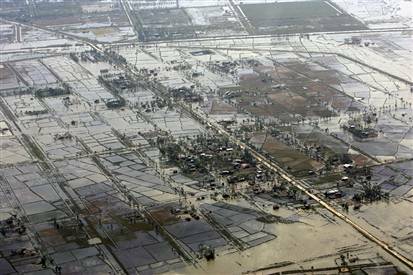 LONDON/TOKYO (Reuters) – Soaring commodity costs are denting manufacturing activity in Asia and Europe and the outlook looks bleak as new orders drop off in the face of rising prices, surveys showed on Tuesday. Manufacturing activity in the euro zone contracted in June for the first time in three years while business confidence in Asia’s largest export markets is buckling and output has likely contracted further in the United States. Purchasing managers indices showed manufacturing activity in the euro zone fell to 49.2 in June, China saw its index fall to a near three-year low of 52.0 while in Britain it contracted at its sharpest rate since December 2001. The 50.0 mark separates growth from contraction. Factories worldwide have struggled in the face of soaring raw material and energy costs — oil hit over $143 a barrel on Monday. Meanwhile, the Bank of Japan’s tankan corporate index of big manufacturers’ sentiment dropped to plus 5, from 11 in March, showing their mood has not been darker since 2003. LONDON (AFP) – European equities dived on Monday after heavy falls earlier in Asia as markets were gripped by growing concern that the US economy was slipping into recession, dealers said. Stock markets in Europe and the United States had sunk late last week following signs that the fallout from the US credit crisis was far from over. In late morning European trade on Monday, Frankfurt, London and Paris stock markets chalked up fresh losses of about 1.5 percent. 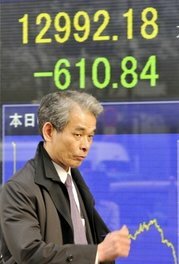 Asian stocks plunged earlier Monday with Tokyo ending down almost 4.5 percent, Hong Kong tumbled 3.07 percent and Seoul gave up 2.3 percent. Singapore and Sydney both shed about 3.0 percent. “Not a great start to the week with the UK following falls in the US Friday and Asia today,” said Mike Lenhoff, strategist at brokerage Brewin Dolphin.